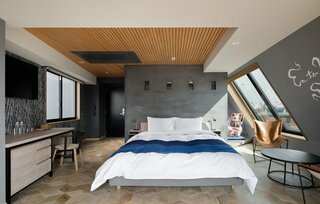 No relation to the American magazine of the same name — Wired Hotel Asakusa is a spinoff of the popular local Wired Café, and it brings a much-needed infusion of youthful energy to a Tokyo hotel scene that’s perhaps better known for skyscraper-topping luxury hotels than cutting-edge boutiques. And if it reminds you just a little bit of certain American boutique hotels, it’s no coincidence. Wired was designed and branded in part by OMGFCO, the creative agency responsible for the Ace Hotel Portland, among others. Of course, the lineage doesn’t matter as much as the product itself, which is more than capable of standing on its own. Wired includes some hostel-style shared “Dormitory Class” rooms, but fear not: on Tablet you’ll only find the private, traditional hotel-style rooms — some of which, however, feature bunk beds, for those traveling with larger parties. To the greatest extent possible, the hotel used local vendors, artisans, and craftspeople to source everything you can see and touch — much of which is for sale, in case you’re interested in taking part of your stay home with you. And as you might expect from a hotel project undertaken by a café company, Wired Hotel’s own Zakbaran café and bar is something special, offering tofu-based cuisine and inventive sweets to hotel guests and neighborhood locals alike.